"If they want to continue to go the route of taking over Syria, they can do that," said Nikki Haley at a�UN press conference�today, without explaining how a nation's only recognized government can 'take over' the country it governs. "But they cannot do it with chemical weapons. They can't do it assaulting their people. And we're not gonna fall for it. If there are chemical weapons that are used, we know exactly who's gonna use them." Haley was referring to the Syrian government's impending push to complete its military campaign of recapturing its land from the terrorist factions and militias who, with extensive help from the US and its allies, have been holding communities hostage in a failed attempt to take over Syria. Her supernatural prophecy is just the latest in an increasingly bizarre string of claims being advanced by�political figures�and�establishment media�that the Assad government is planning to use chemical weapons to complete that campaign in Idlib. Their narrative is that�the Russian government's warnings�of a plot by the Al Qaeda-linked terrorist factions occupying the region to stage a chemical weapons attack and frame the Syrian government for it are actually just a preemptive "smoke screen" to allow them to get away with committing war crimes. When Haley said "we're not gonna fall for it," this is the 'it' she was referring to. Wow. 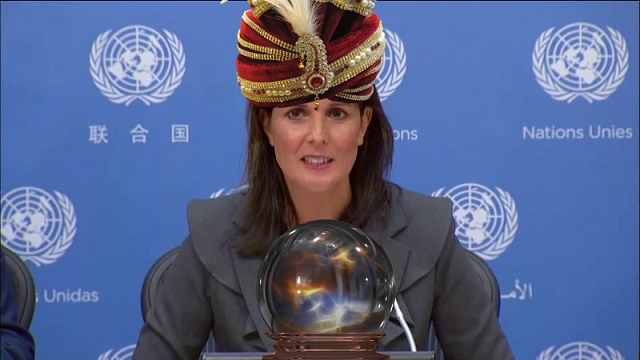 Nikki Haley can predict the future. Here she�s blaming the Syrian government and its allies for a chemical attack in Syria�s Idlib that hasn�t even happened yet.